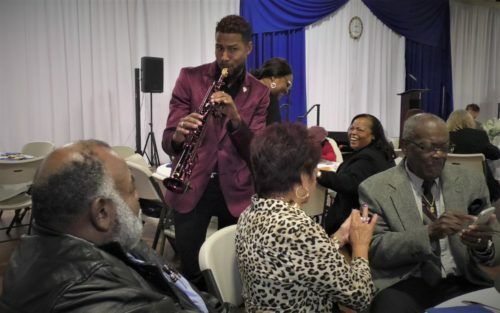 OCEANSIDE–’In the footsteps of a dreamer’ was this year’s theme at the annual Dr. Martin Luther King, Jr. Community Prayer Breakfast, held at the QLN Conference Center in Oceanside. Oceanside city officials, educators, and religious and community leaders, were among the more than 200 attendees at the Monday morning event, hosted by The North San Diego County NAACP. Among the speakers were National NAACP board member Ron Hasson, who served as keynote speaker, and U.S. Representative Mike Levin (D-CA). The highlight of the breakfast was the presentation of the 2019 Martin Luther King, Jr. Community award, given to an Oceanside or Camp Pendleton resident who exemplifies the philosophy and ideas of Dr. King. Oceanside Mayor Peter Weiss and City Council members presented the award to community activist Cynthia Rice. Rice received the award for her fight for the Civil Rights Act, the Americans with Disabilities Act, DACA, Promise, children’s health insurance and VAWA. She also supports hunger and homeless organizations such as local food banks, MiraCosta Food Pantry, Women’s Resource Center and the Boys and Girls Club, and she is a member of the North San Diego County NAACP, North County African American Women’s Association and represents North County on the Association of Funding Professionals, San Diego Chapter, Board of Directors.